Last year worlds military expenditure is $1.7 trillion or $1776 billion accordong to Stockholm International Peace Research Institute (SIPRI) , Swedish think tank organisation. Endind world poverty require 10% of this amount and that is $175 billion, it is about to 5 % of US federal budget ($3.4 trillion) in 2014. It is also less than 1 % of the combined income of richest countries in the world. 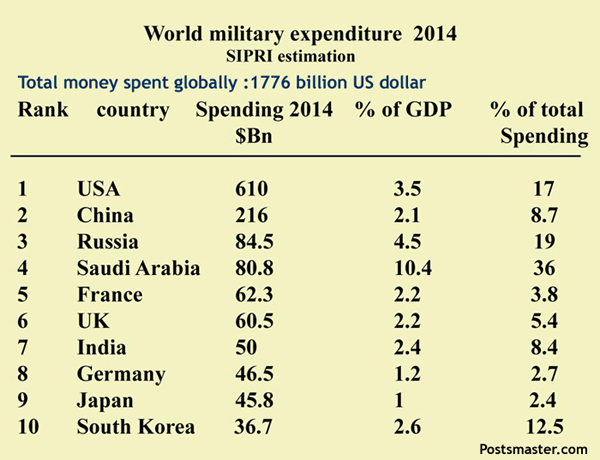 US spent 40% more than global total military expenditure. The money is spent for defence research programs, new equipment buying and maintenance of forces such as Army and Navy. All countries spend a major percentage of their tax revenue each year for the military. The United States military expenditure for the year 2014 is 17% of revenue. CIA and other research institutions such as International Institute for Strategic Studies are also analyzing global military expenditure in the meantime and results may vary eachother depend on resources. The case is almost same as that no person actually reveals his monthly salary to others .This list is based on the estimations conducted by SIPRI in 2014. Whilst the estimated figures may vary from nations official disclosures,i.e., According to Chinese official disclosure annual defence spent is 128 $ billion and SIPRI estimation is 216 $ Bn. The United Nations Children's Fund (UNICEF) approximations for 2015 indicate 5.9 million children are dying every year globally (16000 a day) due to poverty. Studies conducted by World Health organisation (WHO) reveals 30 % of human death is due to poverty worldwide. 1/8 person in the world is hungry according to Food and Agriculture Organization of the United Nations. Child death is explained in terms of Under- five mortality rate, it is the chance of newborn baby will die before reaching age 5 per 1000 births. In developed countries, 1 out of 143 children dies while its 1 out of 8 in poor countries. 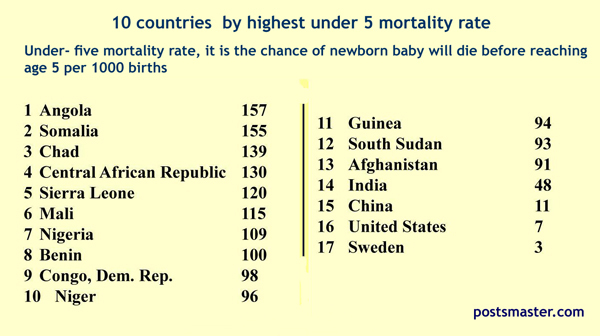 The chart shows countries has the high Under-five mortality rate. A major percentage of Child deaths occurs in sub-Saharan African countries, more than 40 countries including Angola, Somalia, Chad, Central African Republic, Nigeria, Sudan, etc. Official reports declare 20 % global child deaths, occurred in India .In 2015 as India is the second largest populated country in the world (1.2 billion). Worlds seventh largest populated country Nigeria accounts for 10% of global child deaths. Among all misfortunes in the least developing countries, Starvation and hunger are the dominant rather than lack of medical aids, economic unrest and literacy. In order to decrease Percentage of child deaths, its is mandatory to establish an efficient system especially for preservation and transfer of food items and it is the bottom level campaign for global equality.